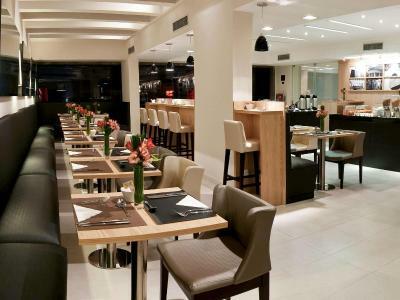 Lock in a great price for Mercure Sao Paulo Pamplona – rated 8.2 by recent guests! The hotel is in a quite good location close to Avenida Paulista. There are a few restaurants close by and the walking seems to be safe as the streets are quite busy. Eu escrevi pro hotel explicando que a reserva era para o dia do meu casamento, pedi a eles que se desse para deixar o quarto mais bonitinho ou com algo especial, já que era uma ocasião especial! Eles responderam que cuidariam para que fôssemos bem recebidos, e nada foi feito. Ficamos um tempão para fazer o checkin, cobraram o valor errado, e quando chegamos no quarto não tinha absolutamente nada de especial! Ficamos bem decepcionados com a estada! Nos hospedamos em outra rede em situação semelhante (noivado) e o tratamento foi completamente diferente. Conseguimos um late check-out que nos ajudou muito com um voo as 17h. Café da manhã deixa a desejar. Pouca opção de frutas servidas em porções mínimas. Salada de fruta feita com 90% de melancia. Gostei da localização. Ótima localização e acomodação. Bem silencioso, também. Café da manhã muito bom e equipe super prestativa! Almoço e cafe da manha PESSIMOS Hotel carissimo, recepcionistas mau humorados. 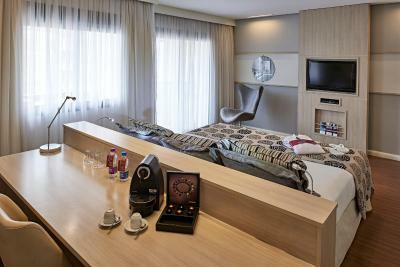 Mercure Sao Paulo Pamplona This rating is a reflection of how the property compares to the industry standard when it comes to price, facilities and services available. It's based on a self-evaluation by the property. Use this rating to help choose your stay! Enjoy an excellent location in the trendy Jardins neighborhood in Sao Paulo staying in the Mercure Sao Paulo Pamplona, which lies next to the 9 de Julho Avenue and 2,650 feet from Paulista Avenue. This 4-star hotel provides spacious accommodations with air conditioning. Each of the guestrooms features a seating area and private bathroom. A varied breakfast is served every morning in the hotel restaurant, where international dishes can be enjoyed. Mercure Sao Paulo Pamplona also invites you to unwind by the outdoor pool and to relax in the sauna. You can also keep in shape working out in the on-site gym. Jardim Paulista is a great choice for travelers interested in gourmet food, museums and food. 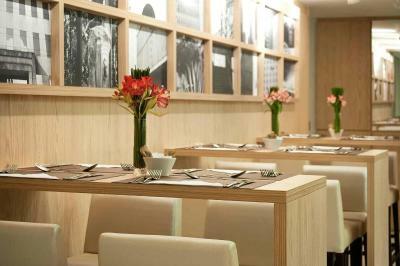 When would you like to stay at Mercure Sao Paulo Pamplona? This air-conditioned room features a king-size bed, a seating area, tea and coffee maker, a safe and a cable LCD TV. 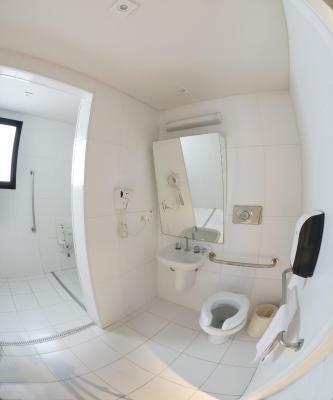 Private bathroom comes with a hairdryer. Private parking is available on site (reservation is not possible) and costs BRL 21 per day. This air-conditioned standard room features a king-size bed, a seating area, tea and coffee maker, a safe and a cable LCD TV. Private bathroom comes with a hairdryer. Featuring extra amenities, such as daily newspaper and an espresso maker, this air-conditioned room also has a LCD TV, mini-bar and safe. There are slippers and bathrobe available in the bathroom. This air-conditioned room features a queen size bed, a seating area, tea and coffee maker, a safe and a cable LCD TV. Private bathroom comes with a hairdryer. Hotel surroundings – This neighborhood is a great choice for travelers interested in gourmet food, museums and food – Check location Great location - show map Guests loved walking around the neighborhood! House Rules Mercure Sao Paulo Pamplona takes special requests – add in the next step! Mercure Sao Paulo Pamplona accepts these cards and reserves the right to temporarily hold an amount prior to arrival. Please inform Mercure Sao Paulo Pamplona of your expected arrival time in advance. You can use the Special Requests box when booking, or contact the property directly using the contact details in your confirmation. Not great air conditioning system. Breakfast could have more healthy options. Excellent location. Comfortable bed. Good gym. They could work on the smell of the restroom, and elevator... the restroom has a weird smell, I had to close the door to be able to sleep and even like that I could smell it. Also the hair dryer doesn’t dry (it’s toooo weak) bring your own girls! The garbage pails are horrible! Please fix! It was the longest check in I had in my life, I had to wait for almost 45 min, there was just 1 lady attending and I had a baby with me and my wife pregnant, we didnt receive priority and we had to wait for that long. We had to took all of our baggage from the taxi and bring it inside the hotel, there was no porter available to support and they almost made me take it all to the room (I had to deny it). The lady was not gentle at all. When it came for the moment of our check in they realized that my booking was not there (some problem with the booking.com and their booking system), then we had to wait another 10 min for them to sort this out. When we got to our floor, the keys they provided didnt work, we had to call the support and wait for them to fix. When we got to our room, internet was not working, another 15 min to have them to fix the internet. Then when I needed to do my check out, the lady informed that they would have to charge me if we stay above the check out limit... I was expecting more of this Mercure on customer care.